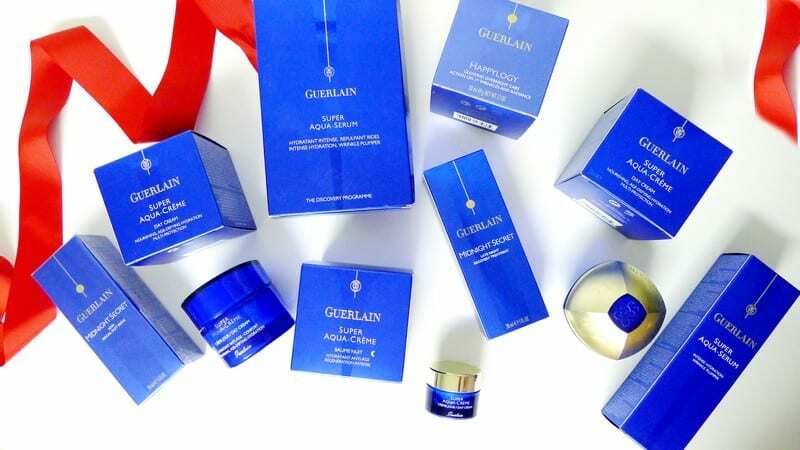 GUERLAIN is a five generation of Perfumers and skincare house. It is among the oldest in the world. Guerlain began in the 19th century by a chemist, soap maker and perfumer, Pierre-François-Pascal Guerlain. The brand’s target from the begging was focused to attract the attnetion of the greatest courts in Europe. Today it remains a high end luxury skincare and cosmetic brand. 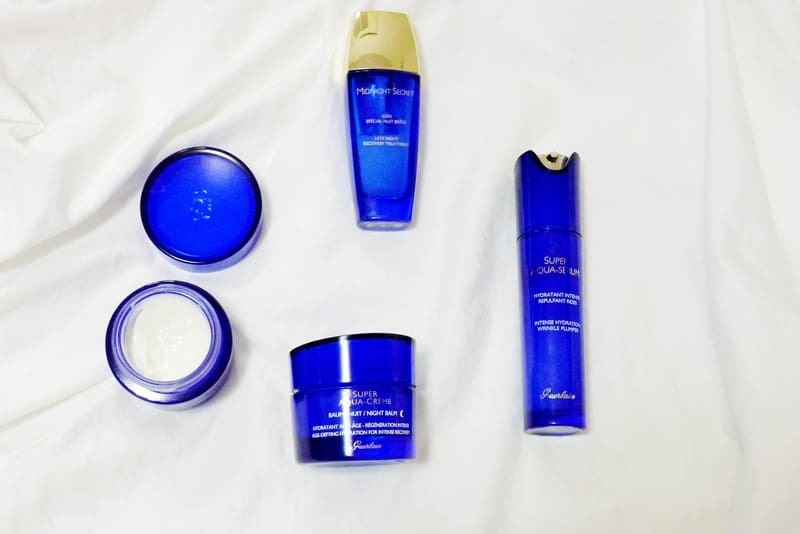 I have been using Guerlain Super Aqua skincare line on and off for almost a decade. Although, I love trying new brands, potions and lotions, but I always find myself reverting back to Guerlain. I find when my skin starts acting up and takes a dive for the dry – Guerlain’s Midnight Secret always saves the day. It is super moisturizing and one of the best skincare line for me. What I love about Guerlain besides the price is that it is deeply hydrating. I love that it absorbs really nicely and quickly into the skin. It works well with other skincare brand if you are into mixing face oil like Caudalie Paris’ Vinosource Overnight Recovery Oil to give an extra boost of moisture. This is essential for me during the winter. The Geurlain scent in their skincare is quite luxurious. It isn’t too strong or stings your nose. I mainly use the Super Aqua line. I’ve also tried Guerlain’s more luxurious Age Defying line like the Orchidée Impériale and the Abeille Royale in sample sizes. As wonderful they were for my face, I figure I should wait until my 40s or 50s. Because seriously, if I start using them now, what am I going to use later? The Guerlain Super Aqua line uses “Aquacomplex purifies cellular water to relaunch hydration flows and restore youthfulness. Like a protective shield, Super Aqua skincare products strengthen the integrity of the epidermis and resistance to attack. Infused with pure and active water, the skin is more resistant to the effects of time.” Like collagen, our skin looses moisture as we age. Super Aqua-Lotion Replumping Toner: This is hands down the BEST toner I have ever used. It glides on so silky and instantly plumps and hydrates your skin. I never imagined a simple toner would make such significant improvements. My skin feels smoothing and more supple within a few uses. Thanks to the desert rose flower complex, the originality of its fresh and velvety texture provides incomparable softness and comfort. Skin is left moisturized, luminous, and healthy-looking. Super Aqua-Serum: A deeply hydrating serum that revitalizes and plumps the appearance of skin while reducing the appearance of wrinkles. Meanwhile it protects against external aggressors for a more plumped, healthy-looking complexion. I like that it is silky and glides on ever so easy! I use this before applying either the day or night cream. Super Aqua-Day Cream: A refreshing cream formula that moisturizes skin. It is a thicker formula that caresses the skin. This formula offers 24-hour hydration, protecting skin during the day and restoring at night. Super Aqua-Crème Night Balm: Another thick formula and powerful face cream to protect skin during the day and restore it at night. Enriched with the benefits of Aquacomplex, it delivers intense recovery at night while prolonging the anti-defying and multiprotective actions of day creams. Perfectly replenished upon waking, it smooths the appearance of fine lines and wrinkles, leaving the skin supple, full of youthful radiance, and free from all signs of fatigue. Issima Midnight Secret: Post party, late night projects, dry winter SOS saviour! This late-night recovery treatment is the ultimate nighttime skin repair remedy. It instantly erases signs of fatigue while soothing and softening redness and irritation. Even with just a few hours of sleep, the skin looks refreshed and well-rested. Hydronoctine detoxifies by replenishing moisture and oxygen to the cells, while yeast extract improves cellular oxygenation. Vitamin E and rice extract combat free radicals. Super Aqua-Eye Serum: An intense hydration serum that supports wrinkle plumping and reviving the look of the eye area. It smooth and hydrate the eye area with this reviving Super Aqua Eye Serum. Enriched with yeast and ruscus extracts to boost microcirculation, this three-in-one formula goes on like a gel, yet it has the comfort of a cream and the strength of a serum. The above set usually last me about 6 months with continuous usage. My tip to you is to wait for Sephora’s VIB sales when they have 20% off and go nuts! Seriously, it’s worth the splurge! The only thing I don’t like is the packaging. The royal blue color is great. The weight of the jars and bottles is lovely. But when you can’t get to the last drops from the eye serum and face serum is so frustrating!! Every time, I throw the bottle away, I feel like I lost $5. Anyone also feel the same way? Boxing Week Sale | Not Just Boxing Day Deals!